With respect to yesterday’s episode in the mortgage market -- yes, it is as bad as you can imagine. Yesterday, the mortgage market was so volatile that banks and mortgage bankers across the nation issued multiple midday price changes for the worse, leading many to ultimately shut down the ability to lock loans around 1pm PST. This is not uncommon over the past five months, but not that common either. Lenders that maintained the ability to lock loans had rates UP as much as 75bps in a single day. A good friend in the center of all of the mortgage capital markets turmoil said to me yesterday “feels like they [the Fed] have lost the battle...pretty obvious from the start but kind of scary to live through it ... today felt like LTCM with respect to liquidity”. The negative consequences of 5.5% rates are enormous. Because of capacity issues and the long timeline to actually fund a loan very few borrowers ever got the 4.25% to 4.75% perceived to be the prevailing rate range for everyone A significant percentage of loan applications (refis particularly) in the pipeline are submitted to the lender without a rate lock. This is because consumers are incented by much better pricing to lock for a short period of time…12-15 day rate locks carry the best rates by a long shot. But to get this short-term rate lock, the loan has to be complete enough to draw loan documents, which has been taking 45-75 days over the past several months depending upon the lender’s timeline. Therefore, millions of refi applications presently in the pipeline, on which lenders already spent a considerably amount of time and money processing, will never fund. Furthermore, many of these ‘applicants’ with loans in process were awaiting the magical 4.5% rate before they lock -- a large percentage of these suddenly died yesterday. To make matters worse, after 90-days much of the paperwork (much taken at the date of application) within the file becomes stale-dated and has to be re-done with new dates -- if rates don’t come down quickly many will have to be cancelled out of the lender’s system. To add insult to mortal injury, unless this spike in rates corrects quickly, a large percentage of unlocked purchases and refis will have to be denied because at the higher interest rate level, borrowers do not qualify any longer. For the final groin kicker, a 5.5% rate just does not benefit nearly as many people as a 4.5%-5% rate does. Millions already have 5.25% to 5.75% fixed rates left over from 2002-2006. This is a perfect example of why the weekly Mortgage Applications Index is an unreliable indicator of future loan fundings and has been for a year and a half. As a matter of fact you will see this index crumble over the next few weeks at the same disproportional rate as it increased over the past several months if rates don’t settle lower quickly. With respect to banks, mortgage banks, servicers etc, under-hedging a potential sell-off with the Fed supposedly having everybody’s back was a common theme. Banks could lose their entire Q2 mortgage banking earnings and middle market mortgage banker may never recover or immediately have to close shop. Lastly, consider sentiment -- this is a real killer. This massive rate spike may have invalidated hundreds of billions spent to rig the mortgage market literally overnight. This leaves the mortgage and housing market very vulnerable. Mortgage loan officers around the country are having a very bad day today explaining to their clients why their rate was not locked and how rates are going to come right back down. They will not feel like getting too aggressive taking new loan applications at least for the next month unless this corrects quickly. We have to see where all this settles over the next few days before making a near to mid-term call on the outright damage because at this point, Fed or Treasury shock and awe is almost certain. Another common theme has been ‘if it doesn’t work throw much more money at it’. Obviously they have been following this closely for the past few weeks, as conditions started to deteriorate, and have likely been waiting to see where the upper range was before shocking in order to get maximum benefit…that would be a humongous short squeeze in Bonds. The problem is…if they do shock her and it is sold into with the same fury that we have been seeing, there may not be an act two. 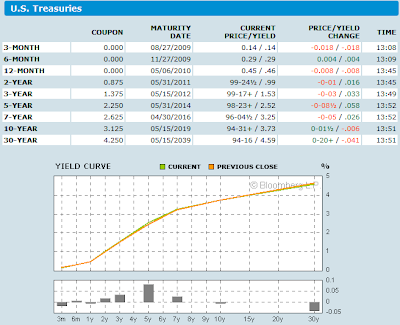 For more on the 10-year treasuries please see Treasuries Massacred; Yield Curve Steepest On Record. This morning there was a bit of a treasury rally on a rumor the Fed was going to buy $10 billion in long dated treasuries but treasuries are now back to the lows of the day, with 10-year yields essentially unchanged vs. yesterday. Mortgage banks are going to be flooded with calls from people wanting to lock at 4.75. Sorry folks, those rates are gone. I called Mark Hanson this morning to see if there was any improvement in the mortgage. Mark said "Rates fell from 5.5 to 5.375 on intervention rumors this morning but are now back to 5.5. If rates stay in the mid 5's, new loan applications will quickly dry up. By the way, that 5.5% rate is pretty much for the "perfect borrower" with a FICO score of 740 or higher and a 20% down payment. Jumbos are hovering near 8% with 1.5% points. Mortgage banks that made unhedged commitments at 4.25-4.75% are now in a position to lose substantial sums of money. Bernanke thought it would be an easy task to keep down mortgage rates. So much for a $1.2 trillion commitment. What's next? A $2.4 trillion commitment? Fannie Mae, Freddie Mac, and the FHA are the lenders of only resort yet the Fed is still struggling to rig the market.